ALL WANDS ARE SOLD OUT!! 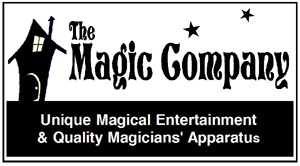 The Magic Company believes that a fine magic wand is a symbol of status and pride for the magicians. 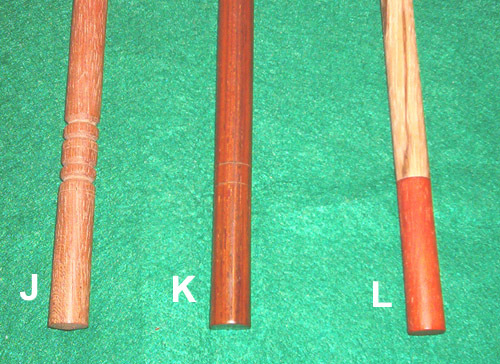 Our wands are hand-turned from the finest domestic and exotic hardwoods available. Our wands are produced in limited runs, or are unique, one-of-a-kind pieces. We always consider custom orders, and will gladly discuss this with you. New items are continuously added to our line, so please check back often to see "What's new!" We will do our best to keep this site up to date. Payments accidentally made on sold items will be returned as soon as possible. For more information on ordering, please see our policies. These are unique wands. Because they are turned by hand, one at a time, there is only one of each. 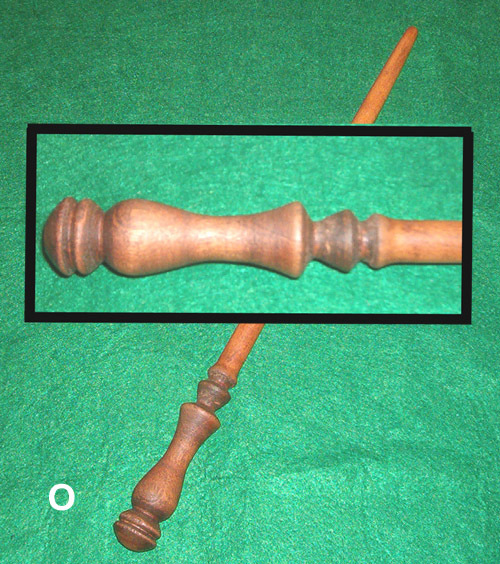 Each wand is considered an individual work of art. A. "HALLOWEEN" Padauk with Ebony flaired tips. 14 1/8 inch x 7/16 inch. Carnauba wax finish. B. "MASTER OF MAGIC" Cocobolo with Ebony flaired tips. 16 3/8 inch inch x 1/2 inch. Carnauba wax finish. 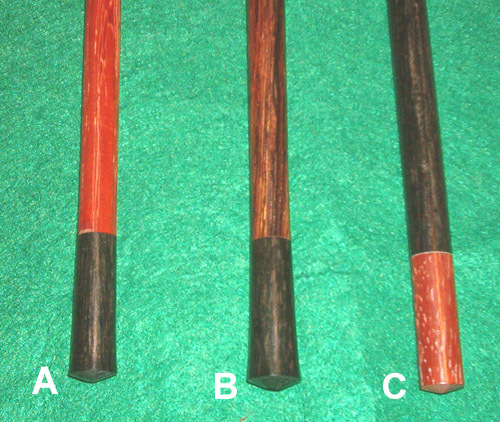 C. "BLACK CAT" Ebony with Padauk tips. 16 3/16 inch x 1/2 inch. Carnauba wax finish. D. "THE MANIPULATOR" Cocobolo with Padauk flaired tips. 16 inch x 1/2 inch. Carnauba wax finish. E. "PRESITIDIGITATOR" Padauk with Cocobolo tips. 15 inch x 1/2 inch. Carnauba wax finish. F. "PARLOUR ELITE" Cocobolo with Ebony tips. 14 1/4 inch x 7/16 inch. Carnauba Wax finish. 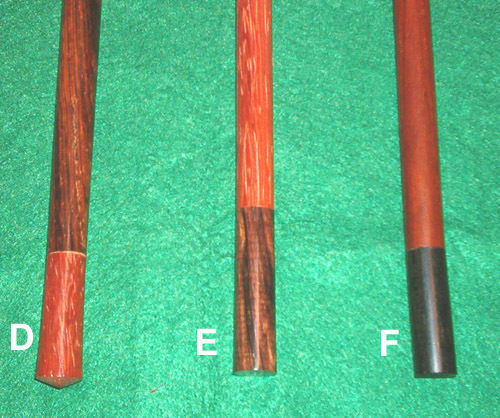 G. "HOCUS POCUS" Black Walnut with Padauk tips. 13 1/8 inch x 1/2 inch. Tung Oil and Carnauba Wax finish. H. "AMERICAN CLASSIC" Black Walnut with Cherry tips. 13 1/8 inch x 1/2 inch. Tung Oil and Carnauba Wax finish. J. 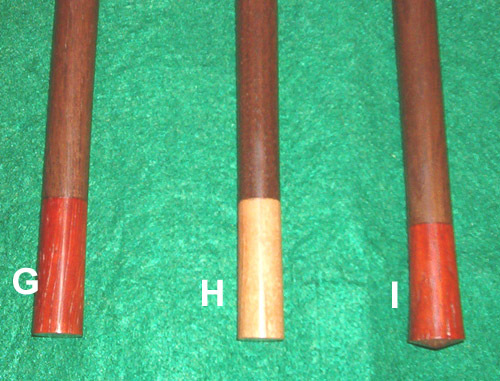 "THE BUSKER" Jatoba (Brazillian Cherry) with turned bead rings. 16 3/8 inch x 1/2 inch. THis has a natural finish and will darken beautifully with handling. 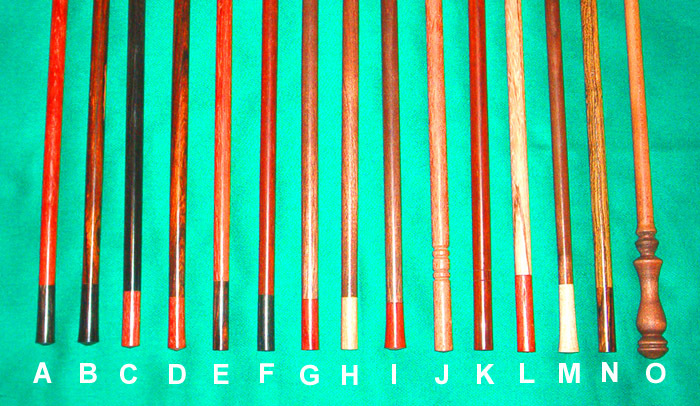 K. "ESCAMOTEUR" Cocobolo. 16 inch x 1/2 inch. Carnauba Wax finish. M. "COLONIAL" Black Walnut with Maple flaired tips. 15 3/4 inch x 7/16 inch. Tung Oil and Carnauba Wax finish. 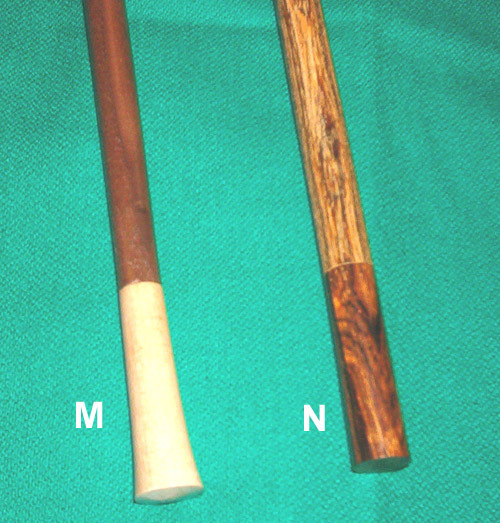 N. "EXOTICA" Bocote with Cocobolo tips. 15 3/8 inch x 1/2 inch. Carnauba Wax finish. G. "WIZARDCRAFT" Wizard School style Cherry wand. 12 3/4 inch. Tung Oil and Carnauba Wax finish. Copyright © 2012 Michael Baker / The Magic Company. All rights reserved.